HUECU took over the official Harvard alumni credit card from Barclays, and the job was to develop a DM campaign that targeted all existing Harvard alumni cardholders and rebrand the offering under HUECU, providing for a smooth transition for existing cardholders. 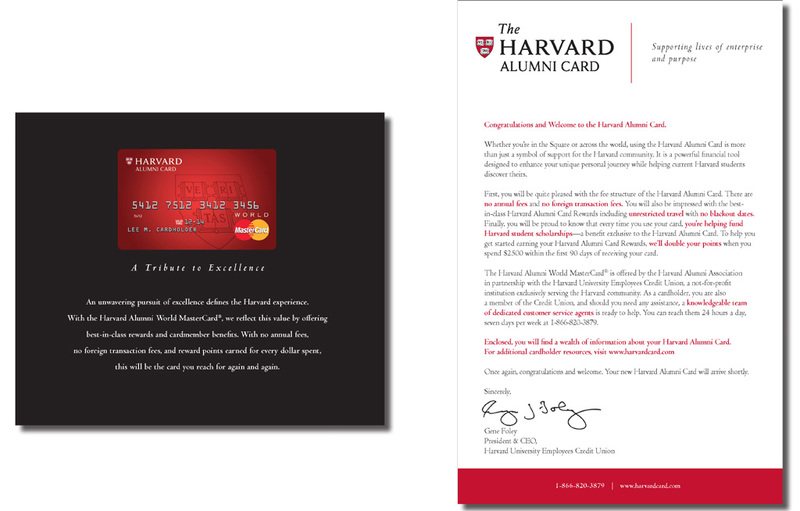 The campaign goals were met in terms of transitioning current cardholders to the new HUECU-issued card while simultaneously establishing a baseline brand positioning for the new Harvard Alumni Card. The tagline “Supporting Lives of Enterprise and Purpose” was adopted as the official tagline for the card.